Create a more custom look by matching your Hager door hinges to the door knobs, handlesets, or lever handles that you choose for your new home. Hager door hinges are sold each. Are these hinges for exterior doors? Meaning that the pins are not easily removable? These can be used on an exterior door yes, but they do not have non-removable pins. 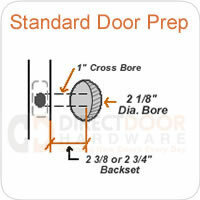 If you have an out swinging door and want non-removable pins you'l want to find a hinge that has that option.